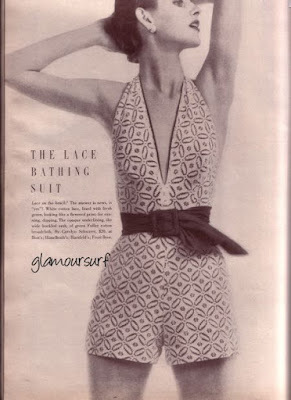 This week we explore vintage swimwear fashions from 1950. Lace on the beach? The answer is news, is "yes"! White cotton lace, lined with fresh green, looking like a flowered print - for sunning, dipping. The opaque underlining, the wide buckled sash, of green Fuller cotton broadcloth. By Carolyn Schnurer, $20, at Best's; Himelhoch's; Hartzfeld's; Frost Bros.
All time shape for a neat look, active performance. In navy-blue, now with a spatter of giant white polka dots, double shoestring straps. By Saucony in cotton and wool woven with lastex, $10. The striped terry cloth towel by Martex, $4. Both at Bloomingdale's. Suit, also at Vandervoort's; The Broadway. 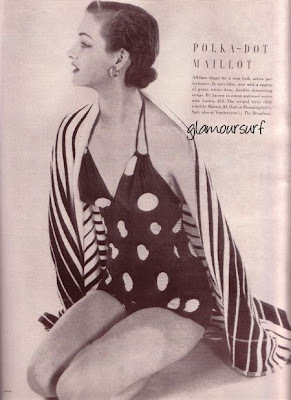 Tomorrow we'll feature the Maillot Top, Beach Transparency and the Dressmaker Suit.